What Are the Health Benefits of Swimming in Sea Water? A swim in the sea may improve your mood and health. Hippocrates first used the word “thalassotherapy” to describe the healing effects of seawater, according to Pacific Naturopathic. Ancient Greeks appreciated the health and beauty benefits of this mineral-rich water and bathed and soaked in seawater-filled pools and hot tubs. Among several benefits, swimming in seawater can help increase your immune system function, improve circulation, promote overall well-being and hydrate your skin. Seawater contains vital elements, vitamins, mineral salts, trace elements, amino acids and living microorganisms that can produce antibiotic and antibacterial effects to help promote a healthy immune system. Reportedly, the components of seawater, similar to human blood plasma, are easily absorbed and utilized by your body while swimming. Inhaling a sea mist filled with negatively charged ions, or molecules that attach to your lungs also boosts your immune system, according to naturopathic doctor Connie Hernandez. In addition, proponents claim that swimming in seawater opens pores in the skin to allow the absorption of sea minerals and the expulsion of disease-causing toxins from the body. Swimming in seawater may help facilitate the circulation of blood in your body. Your circulatory system -- made up of the heart, capillaries, arteries and veins -- carries oxygen-rich blood from your heart to your body, then returns blood to your heart again. The main purpose of thalassotherapy, or seawater therapy, is to increase blood circulation. Swimming or bathing in warm seawater improves circulation by restoring essential minerals depleted by stress, a poor diet and environmental poisons, according to the Thalasso Experience website. Seawater is used by many for overall improved health and well-being. Swimming in warm seawater purportedly activates the body’s healing mechanisms to fight conditions such as asthma, arthritis, bronchitis and inflammatory diseases, as well as common aches and pains. Magnesium-rich seawater purportedly can also relax your muscles, reduce stress and help induce sleep. Magnesium depresses nerves to relieve nervous irritability for an increased sense of calmness, according to wellness pioneer and author J.I. Rondale. The magnesium in seawater may also help hydrate and improve the appearance of your skin. According to a study in the February 2005 edition of the “International Journal of Dermatology,” bathing in a magnesium-rich Dead Sea salt solution helps promote skin moisture. People with atopic dry skin, or dryness on the skin’s surface, submerged one forearm for 15 minutes in a bath solution containing 5 percent Dead Sea salt and the other forearm in regular tap water. Researchers discovered that the salt solution improved skin hydration and significantly reduced skin inflammation symptoms such as redness and roughness when compared to tap water. 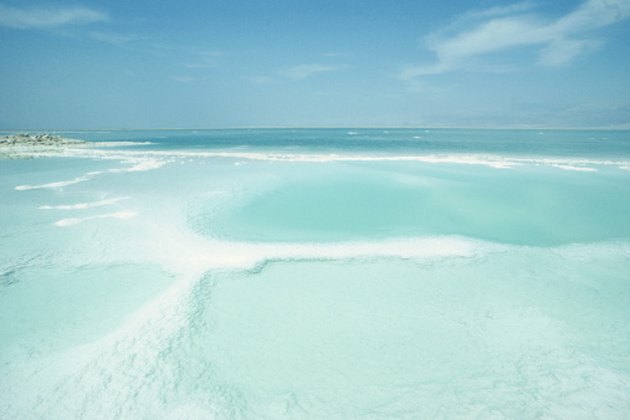 Observed skin benefits were attributed to the high magnesium content of the Dead Sea salt. What Are the Benefits of Saunas at the Gym? What Are the Benefits of Sea Salt Water?